An easy to use salt contamination gauge, equivalent to the Bresle patch method for measuring the concentration of soluble salts on steel surfaces in accordance with ISO 8502-6, 8502-9. 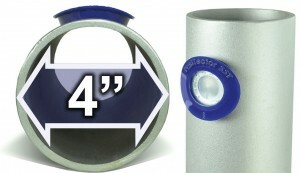 The Positector SST is supplied with a reusable PosiPatch with Standard or Flexible magnetic ring. Magnetic ring attaches to steel with no residue to clean. Standard magnetic ring for flat surfaces and diameters >1m. Flexible magnetic ring for i.d./o.d. diameters >10cm3. Automatic air removal through a watertight, air permeable membrane. Safe and flexible dispensing tip inserts into PosiPatch so no need for sharp needles. Reusable patches that saves time and money. Onscreen user interface to walk users through the Bresle test method to simplify the task. 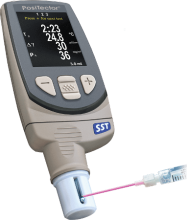 Conductivity probe specifically designed for ISO8502-6, 9. Displays test duration, sample temperature, conductivity (µS/cm) and surface density (mg/m2) or µg/cm2). Using the measured conductivity value and the sample test volume (set within the gauge menu), the surface density of the salts (mg/m2 or µg/cm2) is automatically calculated in accordance with ISO 8502-9, saving the gauge operator time and eliminating the chance of a calculation error. Packing List: PosiTector SST (standard / advanced body) and probe, protective rubber holster, certified conductivity standard, certificate of calibration, belt clip, wrist strap, 3 AAA alkaline batteries, instructions, protective lens shield, USB cable, PosiSoft Software, 2 year warranty, PosiPatch (5), standard magnetic ring, syringe & plastic tip (2), 250ml DI Water, cups (5), hard-shell carrycase.